The 11.4 million mile swab kit – microBEnet: the microbiology of the Built Environment network. I’m proud to announce that the sample collection for the building science component of Project MERCCURI is complete! 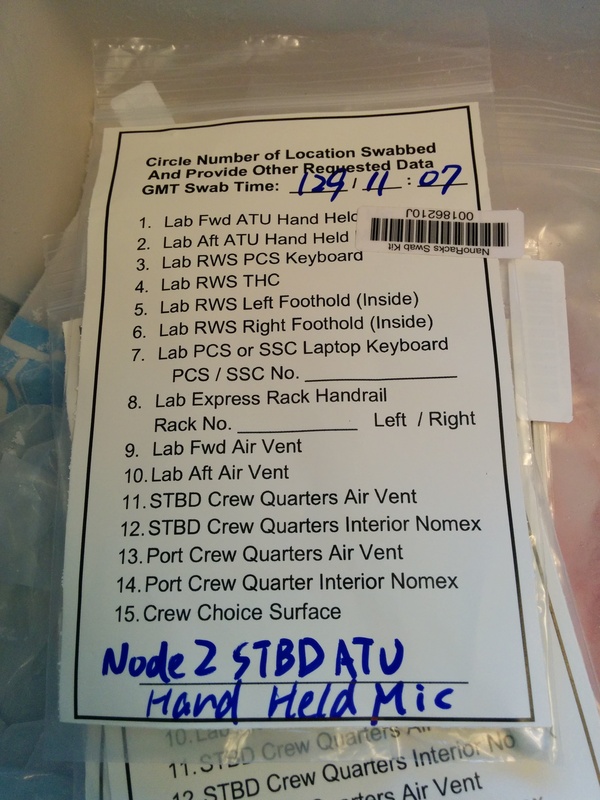 In early May, Koichi Wakata from JAXA (Japan’s space exploration agency) collected swabs swabs of surfaces aboard the International Space Station. Back in June last year, Jenna, Wendy and I went to the Johnson Space Center in Houston where we got to rummage around in the ISS ground unit. Based on what we learned there (and a lot of discussion with NASA and the Astronaut Corps), we developed a list of surfaces from which we wanted samples. So, a little note about jargon. RWS stands for Robotic Workstation. These are the control stations for the various robotic tools aboard ISS, such as Canadarm2. THC stands for Translational Hand Controller, which is to say, a joystick kind of thingy. Well, not exactly. It’s sort of like a joystick, except instead of pivoting around a central point, it slides around without changing its angle. ATU stands for Audio Terminal Unit, which is to say, an intercom. It’s a little box with a microphone sticking out of it. It’s basically Bob Barker’s weird skinny microphone from The Price is Right (which was, evidently, a Sony ECM-51). STBD is short for starboard, which is to say, the right side of the vehicle if you are facing in the direction of flight. Port is the other side. Our ride to and from the space station was the SpaceX CRS-3 mission, which is the third official trip to the space station under NASA’s cargo supply contract with SpaceX. 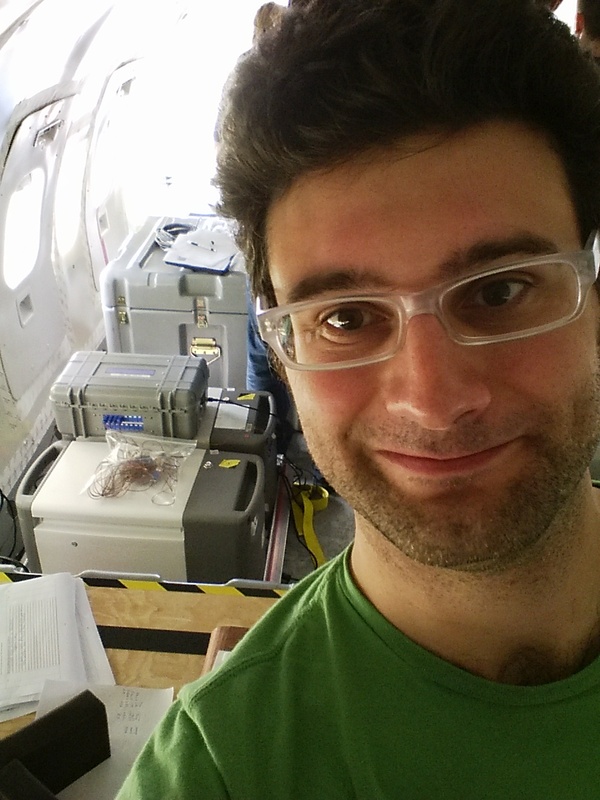 Our spot aboard CRS-3 was generously provided by Space Florida, owing to our project’s selection in the Space Florida ISS Research Competition. 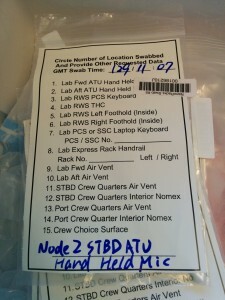 Logistics were provided by Nanoracks (expect to hear more about Nanoracks during the next phase of Project MERCCURI). On May 20th, the Dragon capsule unberthed from the space station and underwent a de-orbit maneuver, splashing down in the Pacific Ocean. I was in Los Angeles at the time, so I went to collect our payload myself. 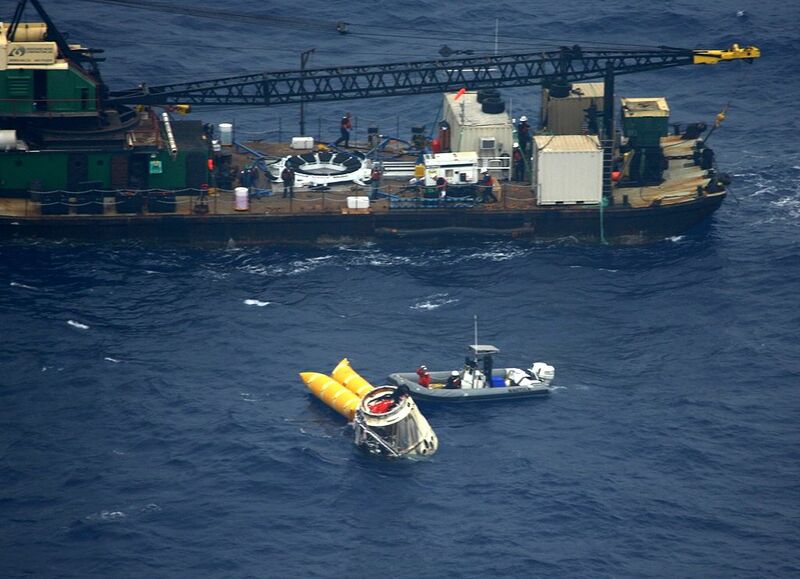 The capsule recovery procedure is, in some respects, even more complicated than the launch. After splashing down in the ocean on parachutes, the capsule is met by two boats. One of the boats is more akin to a barge, and is equipped with a huge crane. This boat captures the capsule, and hauls it aboard. Once the capsule is aboard, the SpaceX crew pulls out the various payload modules (they look sort of like rack-mount computers) and installed in a thing called a CBAN (or so I’m told), which is basically a powered trunk. The CBAN is then moved to the other, faster boat (presumably using the crane), which then motors to the Port of Los Angeles, where it is unloaded into a truck. The truck then drives across Long Beach to the airport, where the scientific teams converge at one of the FBOs. An FBO is sort of like a private terminal. Some of them serve luxury private jets, or handle cargo, catering for airlines, general aviation maintenance, and other various things that happen at airports besides regular passenger flights. 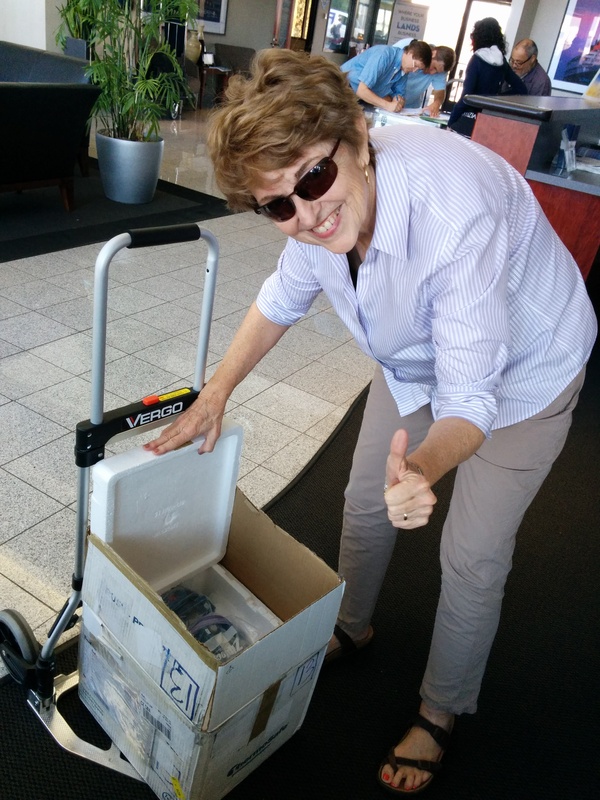 We used the Signature Flight Support (they operate about a hundred FBOs across the United States) at Long Beach. I met up with Carl Carruthers there, and we had an interesting time hanging out with some of the other research teams. 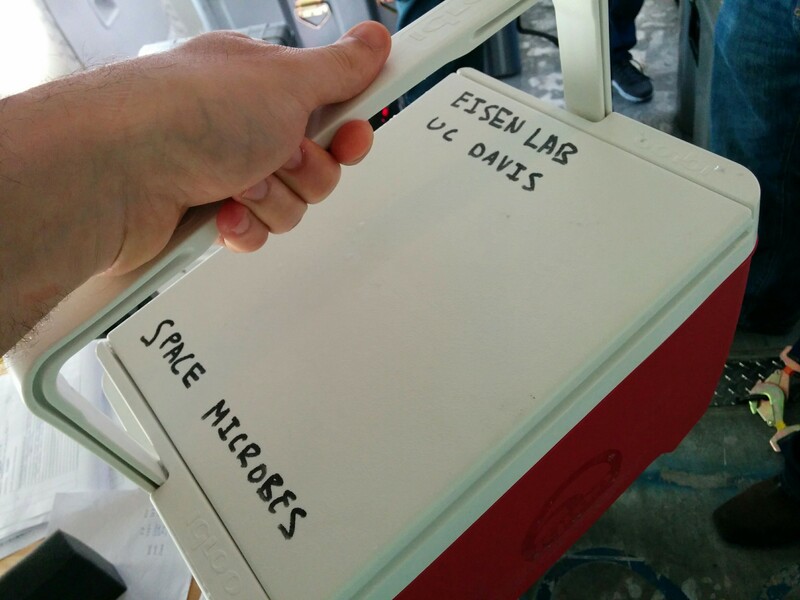 I got to spend some time talking with UCSF professor and astronaut Millie Hughes-Fulford and her students, who were waiting for their first batch of samples for the T-Cell Activation in Aging experiment. 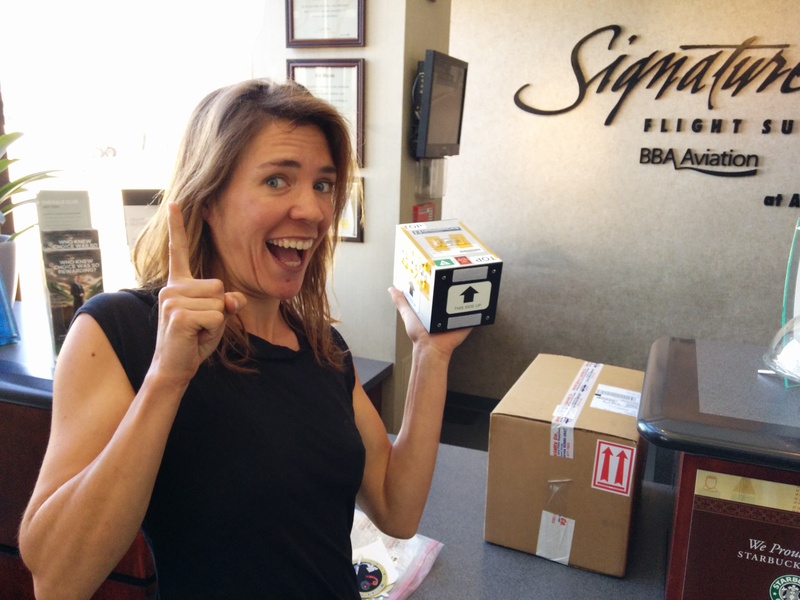 I also got to hang out with Rachel Zarndt, who was there to pick up the little flyonauts for the HEART FLIES experiment. There were perhaps another half-dozen scientific teams waiting to collect their samples, in various states of anxiety. After some delays due to high seas, the truck arrived, and NASA moved everything off of the truck into a chartered DC-9 jet filled with -80s. 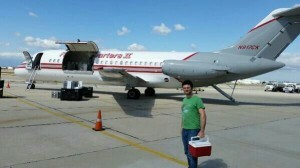 The charter jet was scheduled to fly to to Houston with most of the NASA payloads. 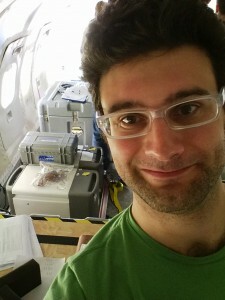 Each payload team that had made its own logistical arrangements (for example, me, with my mom’s car) was called up to the jet, where we went through our checklists, signed a giant pile pf paperwork, and collected our samples. I decided to splurge on a nice plastic cooler at the grocery store, which I stuffed with dry ice (I figure space samples should travel in style). 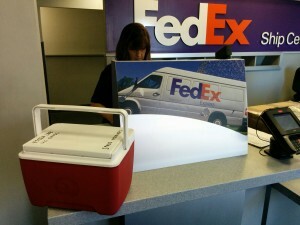 Then, Carl and I drove around the corner to FedEx, and mailed everything off. Much to our amusement, we watched the FedEx truck drive right back to the FBO right next to Signature Flight Services, where the FedEx plane was screeching away next to the NASA charter jet. The next morning, our swabs arrived at Jack Gilbert’s lab at Argonne National Labs, where they are now being processed. Update : Carl tells me that we were mistaken about there being two boats. Evidently there is a still just one. Here’s a photo of the retrieval of the previous Dragon mission (CRS-2).